ATi are laying down the same game plan set by nVIDIA many years back, releasing new VPUs every six to eight months. The Radeon 9800 Pro VPU was released seven months after the highly successful Radeon 9700 Pro and the upcoming 'R420' is on course for a late September release. The Radeon 9800 Pro VPU is really nothing more than a higher clocked 'R300' core that has been tweaked for just a bit more performance. We'll get into the specifics in a moment, but as you're about to see it really does improve performance nicely. In any event, the highly successful Radeon 9800 Pro we are examining now came to market from an unlikely source - Crucial, a division of Micron, and a tier one memory manufacturer. Crucial ventured into the highly competitive world of videocards in the summer of 2002, originally releasing a Radeon 8500LE. Their videocard caused quite a stir in the hardware community due to the use of 6ns DRAM, however the performance of the card was not able to live up to expectations. Crucial appear to have improved on their mistakes, and the Crucial Radeon 9700 Pro was one of the better 9700 Pro's on the market due to its more competitive price and awesome warranty. Today we'll be checking out Crucial's new Radeon 9800 Pro videocard. The same questions arise; does this card live up to the Crucial name and expectations? You'll just have to read on to find out! The Crucial Radeon 9800 Pro is shipped in a standard white box and includes a S-Video-to-composite converter, composite-to-composite cable, a S-Video-to-S-Video cable and a DVI-to-analog converter. 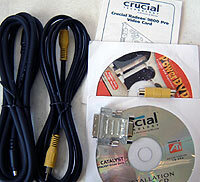 Crucial also include a quick installation guide, the driver CD and a copy of PowerDVD. The Crucial Radeon 9800 Pro is (not surprisingly) identical to the ATi Radeon 9800 Pro and judging by the marks on the capacitors and PCB I'd say the units were probably built in the same factory as the retail ATi Radeon 9800 Pro's. 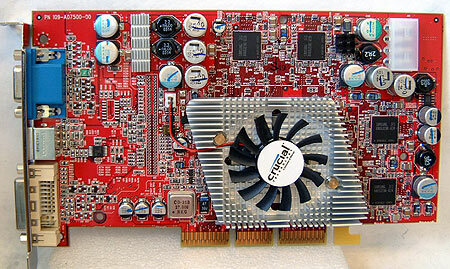 The layout of the card is very similar to that of the Radeon 9700 Pro. The card is about 2 cm longer and the power plant has been moved to the front of the card instead of the back. The Crucial Radeon 9800 Pro now gets its power from the more common molex connector instead of relying on the floppy drive power type connection, which had a nasty habit of getting bent all the time. While there still is a shim around the R350 VPU (which is still higher than the core) because the heatsink juts out at the center, it makes direct contact with the silicon. The Crucial Radeon 9800 Pro uses the same 2.8ns Samsung BGA DDR RAM (K4D263238E-GC2A) that is found on the Radeon 9700 Pro class videocards, and despite being clocked a bit higher does not have or require heatsinks. As any Radeon 9700/9800 owner knows though, the memory does get very hot during operation and it would have been nice for Crucial to place some sort of cooling there for peace of mind. Aside from the excellent performance, probably the next biggest selling feature is Crucial's excellent service record. You don't build up a 9.76 lifetime reseller rating by having good prices alone! These days when it comes to computer components, it's when will a device fail, not if. Having one of the best customer service records certainly makes things easier for you to plunk down that $537 CDN ($399 US) it'll cost you for the card!